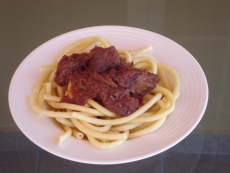 Pastitsada is a speciality from the island of Corfu. It is traditionally made with rooster, but can also be cooked with veal. However, if these meats are not to someone's taste, it can easily be made with beef and is also tasty and we find that children usually prefer it this way. 1kg veal cut in cubes portion size or a rooster cut in individual portions. Clean the meat under cold water and drain it with absorbent paper. In a large frying pan, warm up the oil and fry the meat until it has a golden colour outside but is not cooked inside. Add the onions to the hot oil and fry them until golden brown. Transfer them to the saucepan where the meat is. Stir the meat with the onions and add the wine, cloves, chili powder, salt and pepper. Boil until the wine has been absorbed. Add the tomato paste and turn the meat to seal it somehow in the paste, and boil it with the paste for a few seconds (that helps the meat to soften and preserve the colour). Add the tomato cubes and cinnamon sticks. Add warm water to cover the meat. Leave it to simmer for about 1 ¼ hours or until the meat is really tender and the sauce has absorbed the liquids and is thickened. Remove the cloves and cinnamon sticks. Fill up a long bottom pan with water. Add a tablespoon of salt and half tablespoon of olive oil (the oil prevents the pasta sticking). Add the pasta cut in half. When it is cooked (al dente) add one glass of cold water to the pan. Remove the meat from the saucepan, leaving the sauce. Serve it with some meat on top of the pasta on each plate. Garnish it with a spoonful of grated cheese. This is Mark. Today I have visited your site …. and found some interesting information. We think our visitors will be benefited by your site’s information. This is the reason why we are interested in exchanging links with your site. We will send our link info after getting reply from your end. Please let me have your link so that we can add it. THANK YOU SO SO SO SO much for signing my link list. I sincerly thank you for adding your link. I was wondering if you could add my link somewhere on your website, either in a post or a direct link. I have yours on my webpage so think of it like a favor exchange. Please, I just want to get the word out about my website and all the help possible would be much appreciated. Host Your Link Here No Catches!